Haven’t played pickleball since grade school? 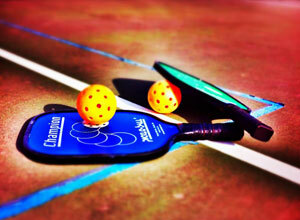 Come out and enjoy an easy paddle game to pick up and play for anyone! Great exercise and a lot of fun! Fall and winter brings the opportunity for the sport of racquetball. We offer two racquetball courts for play. It is best at this time of year to call in for reservations. Court reservations are available for one hour and can be made 24 hours in advance. We also have a ladder if you are looking for players to play. The ladder is located on the bulletin board in the viewing area for Court 2 along with Ladder Rules. Want to play with different players? Challenge Courts available for racquetball and handball players: Rules are posted on the court #2 wall. Call in reservations accepted with a minimum of two players. One court may be reserved at a time. A one hour maximum play time. Court reservations will be forfeited 10 minutes past the reservation time. Eye guards and non-marking shoes are mandatory. Check out the YAC Pro Shop for goggles and balls! 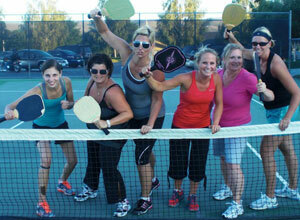 The Yakima Athletic Club offers two outdoor tennis courts for play. You may drop in to use a court if one is available or court reservations may be made for one hour and can be made 24 hours in advance. The courts are also lined for pickleball, a sport anyone can play. 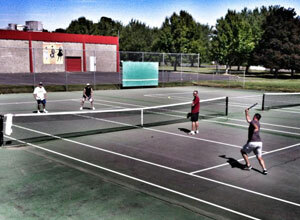 Come to the Yakima Athletic Club to to enjoy a day in the sun - a game of tennis with a dip in the pool.